Eli b. 1847, died when 99 years of age. Adding some color did well. Are you a descendant down the line of Eli W. b. 1847 in Monroe county, Ohio, and William McKenney and Esther Yarnell of Van Buren, Iowa? If you are, please get in touch with me. We need info down this line to organize genealogical ties back to Ohio and hopefully a male descendant who will take a yDNA-37 test at FTDNA. So, please, if you’re related, get in touch! This isn’t “our” Eli W. McKenney, for those reading who are of the family line this blog is primarily concerned, instead this is of a related Eli W., son of William McKenney (1827-1862) and Esther Yarnell (1825-1891). I cover this family in another post, but my belief is that William was a brother of our George W. McKenney Sr. and Eli W. would have been his nephew. George W. McKenney Sr. named one of his own children Eli Wilson. Eli W. McKenney was born 1847 March 2 in Monroe County, Ohio and died 1946 Feb 21 in Los Angeles, California. His wife was Melissa Ann Edwards b. 1846 Aug in Iowa. She died 1921 June 21. The two were married 1865 May 6 in Van Buren County, Iowa. Lottie b. abt 1868, died 1937 March 8 in Bellfower, Los Angeles, California. She married Gideon B. Glascock born about 1867 in Iowa and had at least 3 children: Delbert, Curtis and Milfred. George C. born abt. 1870 in Iowa. Eli served in the Civil War in Iowa’s Company K, 45th Infantry. A bio was published on Eli, 1935 Aug 15 that fortunately gives us his Monroe County, Ohio birthplace. Taken from 80 year Anniversary The Keosauqua Republican 1855-1935 Thursday, August 15, 1935 Page Five. E. W. McKinney, son of William and Esther McKinney, was born in Monroe county, Ohio, March 2, 1847, one of nine children. He moved with his parents and grandfather, to Columbus, in Van Buren county, Iowa, in April, 1851, the year of the big flood. His grandfather, Eli Yarnell, was a soldier in the war of 1812. His father enlisted in the Civil war August, 1862, in C. I. 19th Iowa and was killed the eighth day of December, 1862. E. W. enlisted in 1864 in Co. K. 45th Infantry, and was stationed at Marce, Tenn., at Fort Hendricks, guarding the fort and three railroad bridges and one wagon bridge. He was on guard duty 24 hours out of every three days. There were five detailed in each company as scouts. He was one of the five in his company. Mr. McKinney writes, “we were not in every battle as the rebels were afraid to come in gun shot of our regiment. I mustered in at Keokuk May 16, 1864, and mustered out at Keokuk September 16 on account of expiration of the term of service. I was a member of Shirvere Post No. 77, at Vernon, Iowa. There were 11 names on the register and theer (sic) are only two of us living that I know of today, M. H. Carnes, of Bentonsport, and myself. 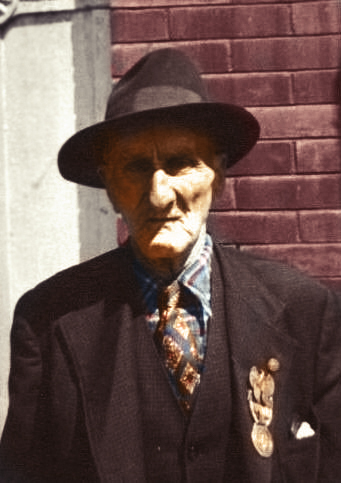 Mr. McKinney claims to be the oldest living member of the Independent Order of Odd Fellows in Van Buren county. He joined the Des Moines Valley Lodge February 13, 1875, over 60 years ago. Mr. McKinney was married on May 15, 1865, to Malissia Ann Edwards. Five children were born to them, two of whom, Katie and Maud, died in infancy. The three living are: Mrs. G. B. Glascock and C. E. McKinney, both of Southgate, Calif., and G. C. McKinney, of Casmere, Wash. The obituary of Eli W. McKinney. Record-Republican dated Feb. 28, 1946. PASSING OF THE LAST CIVIL WAR VETERAN. 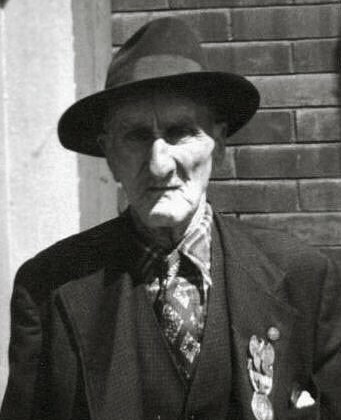 Eli W. McKinney, Van Buren County’s last Civil War Veteran died in California only a few days before the date on which he would have reached his 99th birthday anniversary. A son of William and Esther McKinney, he was born March 2, 1817 (sic: should be 1847), in Monroe County, Ohio, one of nine children. He moved with his parents and grandfather to Columbus, Van Buren County, Iowa in April of 1851. His Grandfather, Eli Yarnell was a veteran of the war of 1812. His Father enlisted in the Civil War in August 1862 in Company I, 19th Iowa, and was killed December 8 of the same year. Eli W. enlisted in 1864 in C. K. 45th Iowa Infantry, and was mustered in at Keokuk. He was also mustered out at Keokuk after serving with the Union Army for several months on guard duty in Texas. He was a member of Shriver Post G.A.R. of Bentonsport, and when that post was disbanded he transferred his membership to Harper post of Keosauqua. On May 15, 1865, he was united in marriage with Melissa Ann Edwards and to them were born five children, two of whom, Kate and Maud, died in infancy. One Daughter, Mrs. G.B. Glascock of California preceded him in death. He is survived by two sons,George C. McKinney of Cashmere, Wash., and Charles of Bentonsport. Graveside funeral services will be held Saturday afternoon, March 1, with internment in Bentonsport cemetery, on the 99th anniversary of his birthday. He passed away on Feb., 22, Washington’s birthday. Marriages in Van Buren County Iowa show Eli McKenney marrying a Melissa Edwards on May 6th 1865. NOTE: I am assuming this unnamed McKINNEY is Eli, son of William. I seem to be unable to locate him in 1900. The 1910 census shows him in Black Hawk county, Iowa living beside his daughter, Lottie. Source Citation: Year: 1910; Census Place: Waterloo Ward 1, Black Hawk, Iowa; Roll: T624_392; Page: 15A; Enumeration District: 14; Image: 582. The 1920 census has Eli back in Van Buren county. In the 1930 census, Eli is in Los Angeles. Joan Olsson gives Melissa as dying 21 June 1921. The census below seems to show an older female having lived in Los Angeles with the family who was known as a mother-in-law. Eli’s son, George C., appears to have never married. He is in the 1930 census in Cashmere, Chelan, Washington, 59 years old, listed as single, and working as a waiter in a restaurant. He was still living in Cashmere at the time of his father’s death in 1946. I am unable to get a fix on son, Charles E. after 1905, and don’t know whether he married and had children. He was reported living in Bentonsport, Van Buren, Iowa in 1946 at the time of his father’s death. Lottie married Gideon B. Glascock (Glasscock) who was born 1867 in Iowa. They were in Van Buren, Iowa, in 1900 with their three children, Delbert, Curtis and Milfred. Source Citation: Year: 1900; Census Place: Bonaparte, Van Buren, Iowa; Roll: T623 462; Page: 3B; . As already noted above, they were in Black Hawk county, Iowa in 1910 with Eli. 1920 found Lottie and Gideon in Montgomery county, Ohio. Again, as noted above, in 1930 Lottie and Gideon were in Los Angeles with Eli. Bellflower, Calif., December 4, 1937. I read an article in your valuable paper concerning my old Civil War Veteran comrade, William Brietenstine of Farmington as being the only surviving veteran of Van Buren County. I claim to be one; and a son of a veteran too. My father enlisted in C. I, 19th Inf. on the 13th day of August 1862, and was killed at Prairie Grove, Ark., Dec. 8, 1862. I enlisted on the 16th day of May, 1864, in Co. K, 45th Inf. I joined Shriver Post No. 77, at Vernon, Iowa, which disbanded about 1916, and in the ledger that had the names of those belonging to the post were one hundred and eleven, and I am the only of those living that I know of. Then I joined the W. C. Harper Post No. 79 at Keosauqua, and I am the only one living that belonged to that one. I now belong to the Post at Large, with headquarters in Philadelphia and branch office in Des Moines. I was born in Monroe county, Ohio, March 2nd, 1847. My parents and grandparents moved from there to Van Buren county, Iowa, in 1851, and located in the town of Columbus a mile and a half above Bentonsport. We lived there nine years. There were about 25 families living there during that time, but when they finished the dam at Bentonsport the families bought lots and moved their homes down there. James A. Brown built his grist mill in 1854 and we were the last family to leave Columbus, in 1858. I still own my home in Bentonsport that I have had for 32 years, and I have been a resident of Van Buren county for 86 years. I also claim to be the oldest member in Odd Fellowship. I was initiated into the Des Moines Valley Lodge Feb. 13, 1875, and still belong to that lodge, 62 1/2 years. And it is between me and Comrade Brietenstein which will be the last Civil War Veteran to check out of Van Buren County. Here are the names of those who lived in Columbus during the eight years I lived there, 78 years ago. On October 24, 1905, Eli W. McKinney purchased lots 4 and 5 in Block 10 of Bentonsport, Iowa. This is the land where the Hal and Ruth Holthe family lives in 2009. In earlier times, lot 4 housed the Western Exchange Hotel. The hotel is named in the deed found in Book U, Page 568 and is dated March 9, 1855. Mike, thanks for posting this. Nice to have this letter from Eli stating who the early settlers were with them in Columbus. Eli Yarnell was his mother’s father. There was a Joseph McKinney in the 1840 census in Van Buren who I believe is also the same in the 1847, 1850 and 1852 censuses there. He was either from VA or KY, born about 1810. His wife was Dorcas, born also about 1810. The 1850 census showed an 18 year old son George, a 16 year old son John, and a 14 year old daughter, Maria. They are Coles Valley, Douglas County, Oregon in 1880. At this point I don’t believe this Joseph McKinney to be related to William McKenney (father of this Eli) and George McKenney b. abt 1832 who was probably a brother of William and the George mentioned by Eli. They were from the Monroe/Belmont/Guernsey County area of Ohio and the person believed to be their grandfather arrived from Ireland between 1795 and 1804 and went to Pennsylvania. From PA they went to OH. To the best of my knowledge, right now, they didn’t go into VA or KY.